When your child gets home from preschool, chances are, they are hungry. After all, they have spent the day playing, learning, and growing, and they need to refuel after spending so much energy. You want to make sure that you are feeding your child only healthy snacks, but plain old apple slices get boring after a while. That being said, you are a busy person and you don’t have time to slave over an after school snack that is interesting enough to please your preschooler’s palate, nor should you have to. When it comes to feeding your kid, it’s best to keep it simple. Anything too complex will not only be a waste of time for you, they probably won’t enjoy it anyway. Fortunately, there are many snacks out there that are not only healthy, but very simple to make. In this blog, we have compiled a list that is sure to please parent and child alike! This is an especially tasty treat when it is hot outside, but even in the cold winter months, kids love this simple and healthy snack. It tastes sort of like ice cream, but it’s fruit! For added protein (and deliciousness), dip them in yogurt! Simply rinse grapes, freeze them for a couple of hours, then dip them in your yogurt of choice and freeze them again. When your kid is looking for a sweet treat, this will be the perfect healthy option. After eating a PB&J for lunch, a snack might sound boring, but these little snacks are completely different! In this version of your favorite lunch, the cucumber serves as the bread, creating tiny and healthy sandwiches. All you need is cucumber, deli meat, and cheese. Slice up a cucumber and create little sandwiches that can be held together with toothpicks (if they last long enough for you to put them in!). You may think of avocado toast as the snack of millennial hipsters, but it also makes a delightful after school snack with healthy fats and whole grains. Not only that, avocado toast is incredibly versatile. You can switch it up with different toppings so you don’t have to worry about snack boredom! To make avocado toast, mash up an avocado. You might add salt, pepper, garlic, and/or lemon into the mix for added flavor. Toast wheat bread and spread the avocado mixture on it. The topping possibilities are endless from here! From tomatoes to eggs to deli meat to cucumbers to salmon, any of your child’s favorite protein or veggies makes for a delightful avocado toast topping. Smoothies are a fantastic after school snack. Not only are they ridiculously easy to make, they are a delectable way to get more fruits and veggies in your child’s diet. Don’t buy premade smoothies from the grocery store, however; these are loaded with added sugar. For the healthiest smoothie, it’s best to simply make them at home. Add a fruit or two (such as strawberries and mango), a green leafy vegetable like spinach or kale, half a cup of plain Greek yogurt, and ice to your blender, then blend till smooth. Who doesn’t love cheese? Kids especially can’t get enough of this delicious dairy product, and quesadillas are the perfect after school snack. The key to making these healthy is to add lots of delicious veggies. You can add any veggies you have around the house, but some especially good options include green peppers, spinach, mushrooms, tomatoes, and onions. To make a quesadilla, spray a frying pan with non-stick spray, then place a whole wheat tortilla on it. Fill the tortilla with cheese and whatever other ingredients you have chosen. Fold the tortilla in half, cook until the cheese is nearly entirely melted, then flip it on the other side. Cut into three pieces and serve warm for a tasty and filling after school snack. This snack is tasty, healthy, and so easy to make, you won’t believe it! All you need is tortillas, lettuce, deli turkey, and tomatoes. Lay out your tortilla, then top with lettuce, turkey, and tomato. Roll this up like a sleeping bag, then slice it into even-sized pieces. You can use a toothpick to hold them together if necessary. Voila! A protein-rich and delectable snack. Trail mix makes for a great snack because it is so versatile and easy to make. All you really need is to combine your favorite crunchy snacks into one, though there are some ways to make it healthier than others. 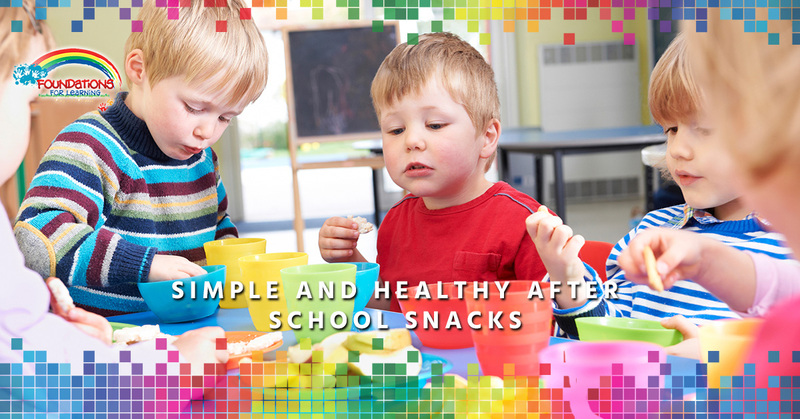 We like combining almonds, walnuts, dried cranberries, raisins, and dark chocolate chips into a delicious mix that your child will love to eat for an after school snack. At Foundations for Learning, we pride ourselves on providing our students with nutritious snacks and a healthy environment in which to grow. If you are looking for a preschool in South Windsor where they can thrive, contact us to schedule a tour!